The town of Motobu sits on the northern part of Okinawa prefecture. Kajinho is located on the top of small hill. Lovely guarding lion Siisa welcome you our guest! And a short walk will take you to panoramic view of the surrounding coast. Inside and outside seating available. Our special pizza has been made since we opened. And drinks particular to Okinawa are received favorable review. 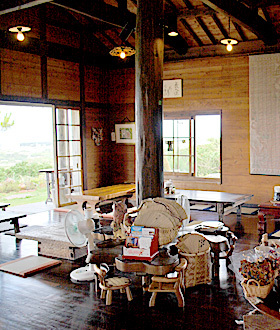 We used an old Okinawa traditional house. 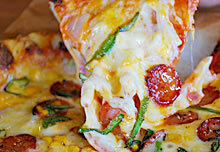 Enjoy our special pizza in atmosphere of ancient Okinawa with a grand view overlooking the neighboring islands. Our special pizza and coffee are made with Okuni-rindo spring water that receives a lot of natural blessings. This slightly sweet water brings out our pizza taste. Many people visit to Okini-rindo to get spring water. Sometimes we need to wait for about 2 hours. Although it takes a long time, we have been used this water since we opened.